We’ve just about recovered from the frenzied apple related activity last Saturday (14th September) so thought it was time to send out a big thank you the work of the Abundance team so far. Thanks to the relentless leafleting of our volunteers and some excellent press coverage in both the Reporter and the Advertiser we’ve had a busy couple of weeks. Co-ordinator Rachel’s house and car now smell like a cider cellar! 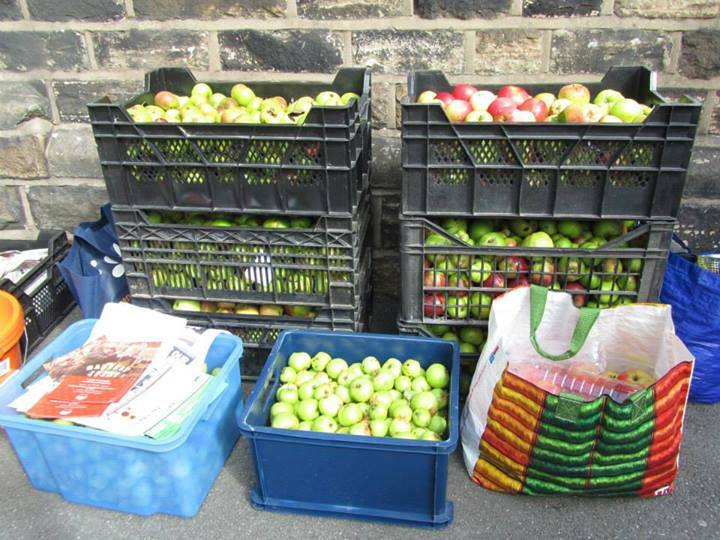 We collected around 200 kilos of apples from allotment sites and gardens in Ashton, Droylsden, Audenshaw and Denton. We have a whole orchard to pick at Mossley Fire Station too! We’ve also been blackberrying with The Friends of Copperas Fields – loads of fruit there but need to go a week earlier next year. We still need to do a couple more picks and a few more volunteers would be a huge help. We also need a few more trees to pick so keep your eyes peeled (pardon the pun) and let us know what you spot. The next pick will be Sat 28th Septstarting at 9.30 in Ashton so please let us know if you want to join in. We’ve also been donated over 11 kilos of plums which we gave away or dipped in chocolate over the camp fire at our Mossley event…children and adults alike were loving the taste of the local plums… “how plums used to taste” remarked one happy visitor! Abundance volunteers ran 3 activities at the Mossley Horticultural Show last weekend (14th September): apple pressing, fruit sculpture making and The Human Fruit Machine. There was something for all ages and in all 15 volunteers helped out on the day – everything from fixing a fuse in our brand new scratter (like a supersonic leaf shredder for apples!) to running the apple washing process was done with a smile. Four people brought along their own apples for a ‘single pressing’ to take home bringing the total fruit on the day to 262 kilos (that’s a quarter of a ton!!). Two of our preserve and cider workshops are now full but there is still room on the preserves workshop next Thurs (26th Sept), 6-9pm in Newton if anyone didn’t book on in time. Apple pick – Sat 28th Sept 9.30 – 12 noon. Meet end of M & S car park in Ashton. Sat 12th Oct – possible apple picking for pressing on the 13th? Harvest Event – Sun 13th Oct 12 – 3pm Hyde Park. We hope that Abundance Tameside will have a big presence at the Operation Farm annual autumn event. We will be pressing again and also running activities such as apple bobbing and the longest peel. We expect a busy day so all hands to the pump (or press) please! Fingers crossed the pigs will be in attendance to help clear up too!